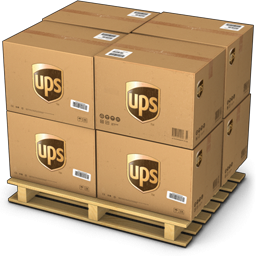 Looking to add a little heartfelt ingredient to your event planning mix? Well this baking set favor is just the flavor you'll need. 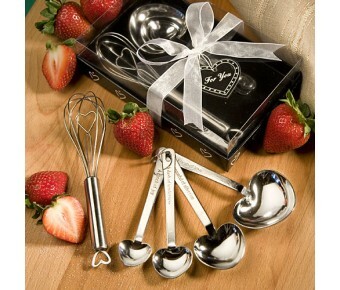 Each set contains a wire whisk and the famous "Love Beyond Measure" measuring spoon set. The 6" x 1.5" whisk is made of sturdy stainless steel with a cheerful heart accent on the handle and an outer and inner wire whisk that playfully forms a heart shape. 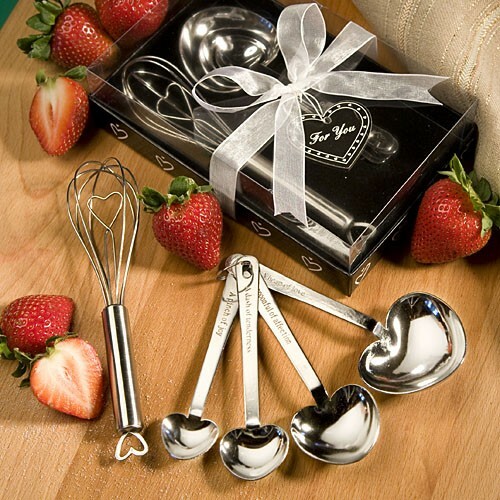 The various sized stainless steel spoons are connected at the handle with a hanging ring and have a heart shaped spoon design with a love saying on each handle including: "a heap of love," "a spoonful of affection," "a dash of tenderness" and "a pinch of joy." Each Fashioncraft exclusive set comes in a deluxe clear topped box with a black velvet insert and black heart design base, tied with a white organza bow and an attached heart shaped "For You" tag.